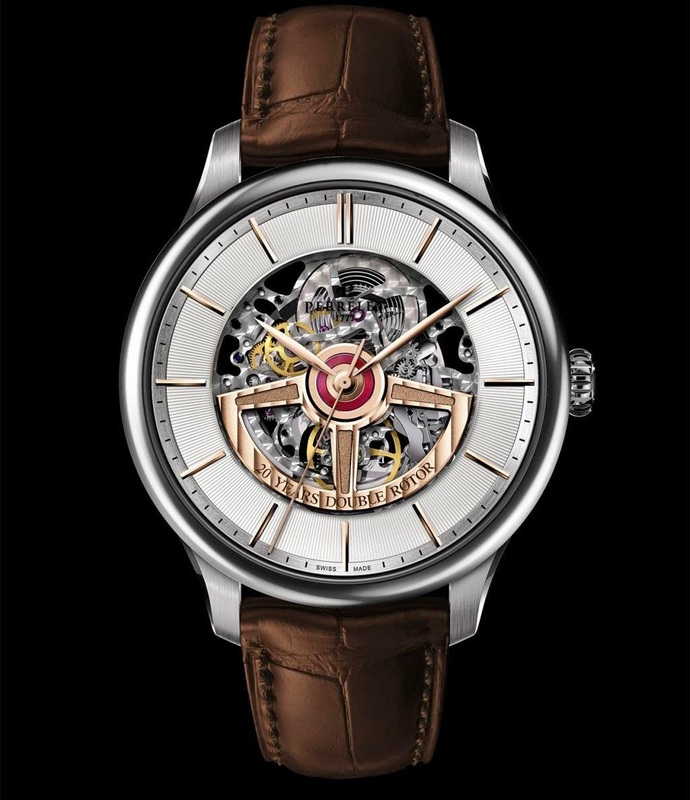 PERRELET celebrates the 20th anniversary of its Double Rotor movement by unveiling the special edition First Class Double Rotor Skeleton timepiece. 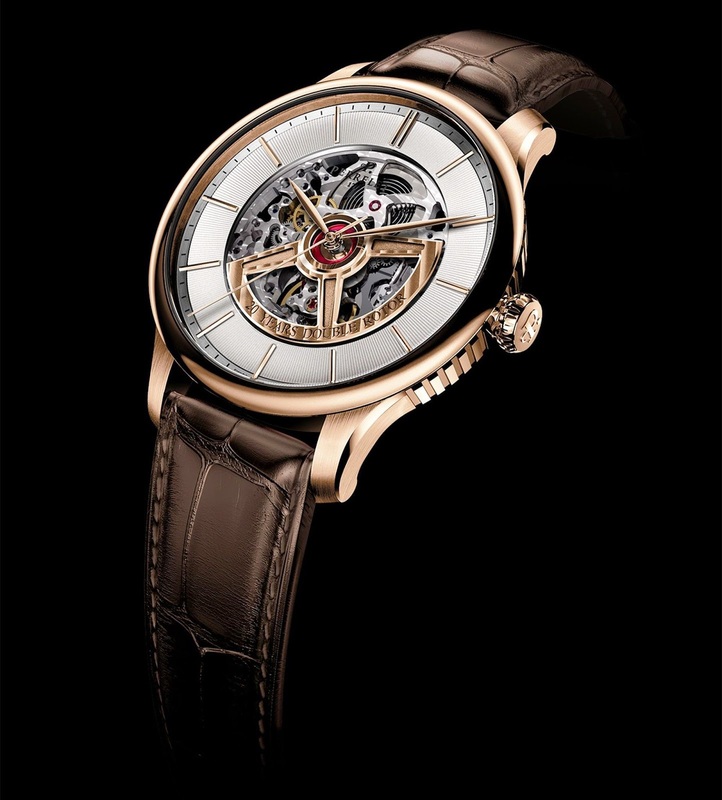 In 1995, as a tribute to Abraham-Louis Perrelet, inventor of the automatic movement in 1777 and to perpetuate a longstanding tradition of avant-garde horology, the PERRELET watchmakers presented the first Double Rotor P-181 caliber automatically wound by an oscillating weight and stemming from more than five years of research and development. From a technical standpoint the Double Rotor constituted a major watchmaking breakthrough, since the mechanism derived its energy from two rotors. The first, called the oscillating weight, is placed beneath the moment, while the second, the upper rotor, is positioned on the dial side and provides a simple and natural way of observing the automatic winding function in action. The perfectly synchronized rotation of the two rotors powers the barrel, thus supplying the mechanism with a continuous source of energy. This mechanism ensures winding that is faster as well as more stable and efficient than a classic system. Moreover, the 26th jewel of the movement, which is visible on dial, proves a valuable substitute for the ball bearing mechanism by ensuring a reduced friction coefficient. 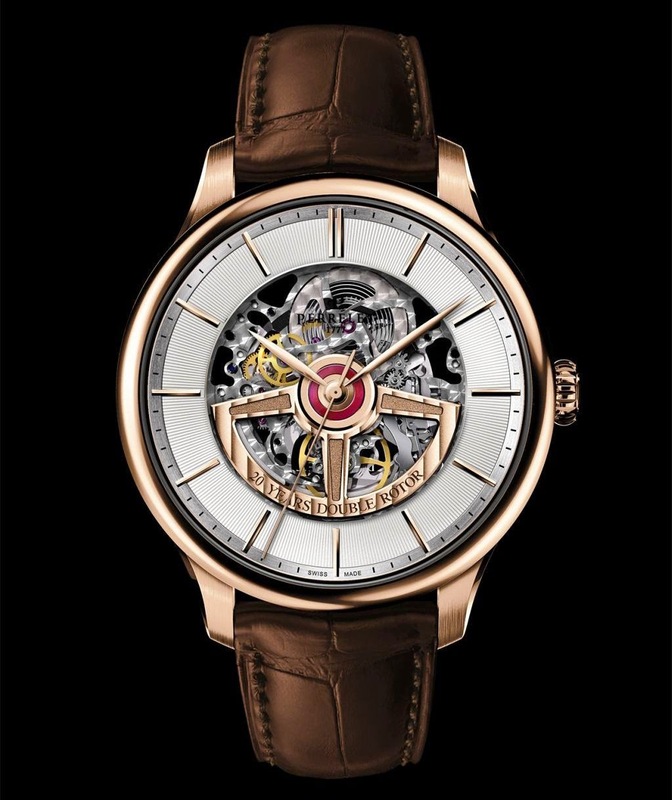 On an aesthetic level, the mobile Double Rotor spins on its axis at the slightest wrist movement and thus endows each collection with unique character and personality, enabling the timepieces to easily reveal their distinctive aesthetic: classic, contemporary, masculine, feminine, understated or extravagant. This patented invention materializes the quintessence of the watchmaking art, represents the brand’s emblematic icon, and contributes to consolidating PERRELET’s international reputation and recognition. 1995: The Dipteros model is the first PERRELET model equipped with the Double Rotor mechanism. The classic round case frames three hands sweeping around a white dial displaying the second 18K gold rotor in the center. 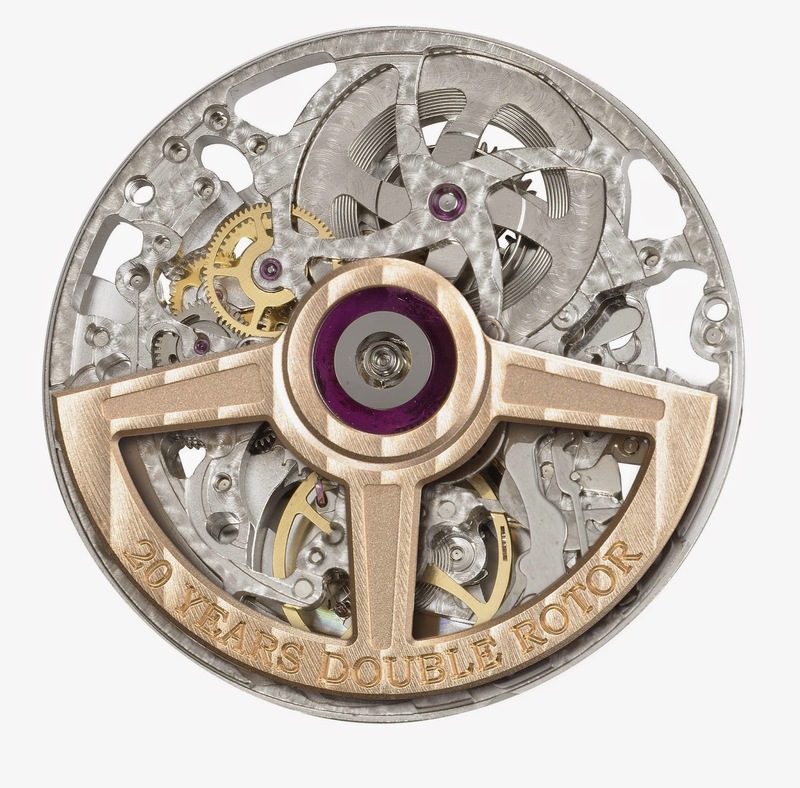 1997: The Double Rotor appears in the feminine mode, with the Lady Tempest and Lady R models featuring a central diamond-set heart. 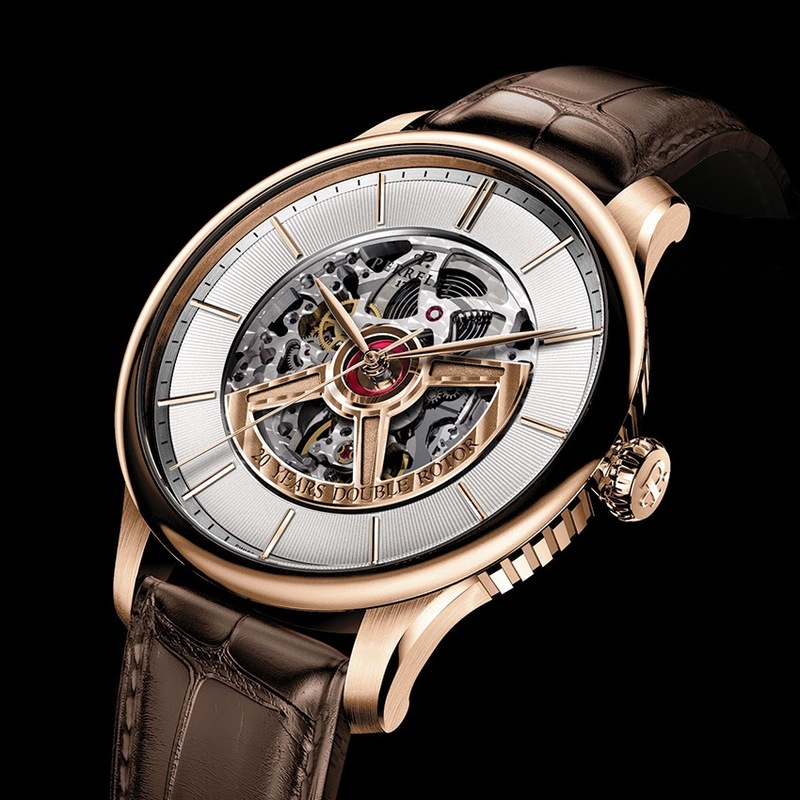 1999: PERRELET develops the Skeleton Watch Double, the first double rotor skeleton watch. 2000: The brand creates an automatic chronograph, the Grand Maître Chronograph, equipped with a Double Rotor movement visible at 12 o’clock. This same year, the new Rectangle Royal watch reveals a Double Rotor movement housed in a rectangular shaped case. 2005: The Double Rotor unexpectedly adorns a tonneau shaped case. PERRELET also presents a new version of the Classic Double Rotor model, a timepiece distinguished by pure lines and contemporary materials. 2008: Ladies are offered a special treat with a lotus flower-shaped upper rotor adding a fresh creative touch to the Diamond Flower ladies’ collection. 2009: A new creative direction. The concept inspires a new generation of PERRELET watch designers to devise a more dynamic interpretation of the Double Rotor, the Turbine family. Equipped with titanium blades, the propeller-shaped upper rotor becomes a “turbine” and covers the entire dial. Disconnected from the movement oscillating weight, the turbine spins at full speed and creates spectacular visual effects. The Turbine rapidly becomes an iconic PERRELET model. 2013 : In keeping with its pioneering spirit and keen to find new ways of expressing its watchmaking expertise, PERRELET reinforces its Turbine collection in 2013 by offering a first-ever association between the playful creativity of this line and horological complications. This approach gives rise to the Turbine Chrono and Turbillon models. 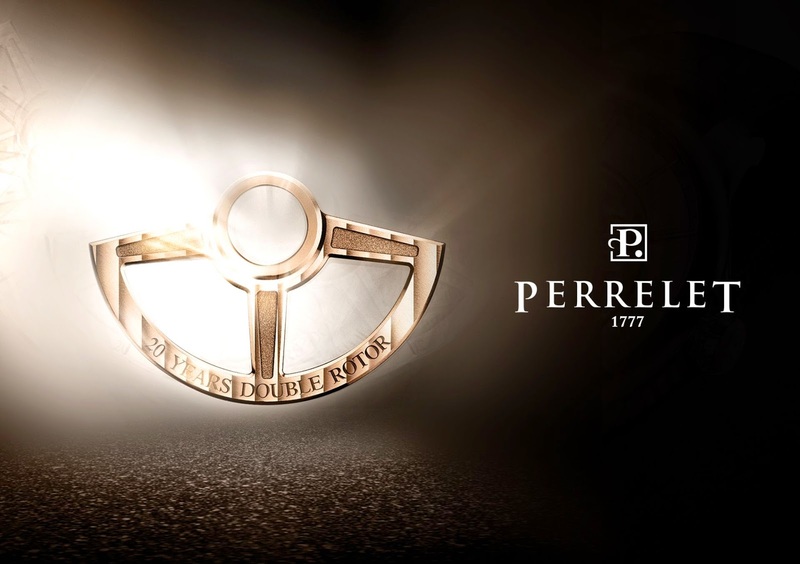 2015: In 2015, 20 years after its launch, PERRELET celebrates the anniversary of its emblematic Double Rotor concept. In this exclusive limited series produced to celebrate the 20th anniversary of its invention, PERRELET raises the Double Rotor mechanism to a new peak or refinement. With the First Class Double Rotor Skeleton, equipped with an in-house Manufacture movement, Caliber P-481, PERRELET associates the horological tradition of its innovative Double Rotor concept with its skeleton-work expertise. Through this ingenious combination, the open-worked dial enables the eye to move freely into the depths of the mechanism, gently rocked by the natural rhythm of the second rotor. The collection introduces two original timepieces, of which each detail flaunts the brand’s watchmaking expertise. The 42.5 mm-diameter round case in stainless steel or 18K 4N rose gold is enhanced by elegant fluting on the sides, traditional decoration and the PERRELET signature. The finely fluted dial punctuated by golden hour-markers is generously open-worked in the center to reveal the entire movement. The 18K 4N rose gold Double Rotor thus highlighted features a brand-new design with a “Côtes de Genève” finish and a special engraving to mark this jubilee. Loyal to its history, PERRELET has maintained the visible jewel at the center of the mechanism, thus enlivening the décor with a distinctive accent. A genuine alligator leather strap fitted with an 18K 4N rose gold folding clasp adds a final touch of elegance. This splendid First Class Double Rotor Skeleton with its pure, restrained lines is issued in limited series of 250 for the steel model and 77 for the rose gold model. Cut-out white dial, golden hour-markers and hands, rose gold (18 cts, 4N) Double Rotor with “Côtes de Genève décor” and special engraving.